Spent a great weekend indoors with my lovey-dovey. It's been five years that we're working together in the Heir of Scars epic fantasy series. I draw his characters and covers and he writes amazing stories about them. 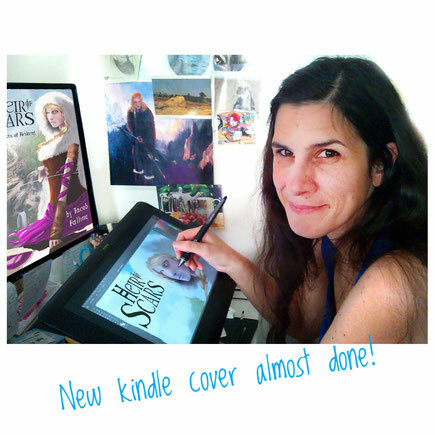 I'm almost finishing a new Kindle cover starring Adria Idonea, "J's" main character. We had fun working together during the day and playing fantasy RPG at night. I have to start working on the cover for Heir of Scars volume II to press Jacob to finish writing it as soon as possible. I want to read the rest. Ehehehe!